This artificial island was constructed of bay sand in 1936-7. 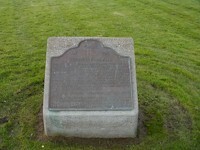 It was the site of the Golden Gate International Exposition, February 18, 1939-September 29, 1940. Tall towers, gigantic goddesses and dazzling lighting effects turned the Island into a "Magic City." The exposition celebrated the ascendancy of California and San Francisco as economic, political and cultural forces in the increasingly important Pacific Region. From 1939 to 1944 the Island was the landing site for flights of the China Clipper. Treasure Island has been a U.S. Naval Station since 1941. In 1996 the Naval Station was decommissioned. 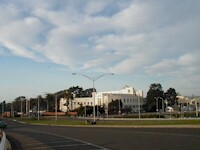 The island is now part of the City and County of San Francisco, though as of 2008 it is still owned by the US Navy.